In China, as elsewhere, new locations and new media have redefined the experience of watching a moving image, beyond the cinematic experience. (1) The visual works that one can view outside movie theatres greatly differ in scope and style. Some explore alternatives to classic Hollywood narratives; others engage with the documentary idea, but they reposition themselves away from realism and, in fact, might offer surreal and even distorted representations of the real. Often crossing the fiction and non-fiction divide, these movies simply fall under the broad category of non-feature films. (2) The producers often embrace the cheaper, more manageable and far-reaching Digital Video (DV) technology and rely on distribution channels as different as television, the internet and galleries. (3) Among non-feature films, Chinese video art and experimental videos have attracted most of the scholarly attention, while much less academic interest has been given to other movies. In this article, I begin to look at these other movies and explore some recent developments of Chinese movie-making beyond the silver screen and outside art galleries, such as the quasi-documentary, the e gao or spoofs, and the cell/DV flicks. I argue that their lightness contributes to establishing a new relationship between movies and pleasure. (4) In my analysis, lightness refers to a self-reflective and often humorous mode of representation, but also relates to issues of production and distribution. Superfluous and often volatile cultural products, these movies are unlikely to be seen as either generating commercial or intellectual capital and thus effectively locate themselves beyond the duality of popular and élite culture. An intriguing example of lightness is Ying he Bai (Ying and Bai, Zhang Yiqing, 2002), a quasi-documentary in which irony goes hand in hand with sensuality. (5) Ying and Bai is an unusual take on the national icon: the panda bear. The movie revolves around a panda, Ying, and his relationship with Bai, his trainer and caretaker, but, from the start, it displaces our expectations about what a panda story is generally about. (6) Not only are pandas among the most widely recognized symbols of China, but they are also linked to a variety of controversial issues, from China’s commitment to wildlife preservation to the so-called panda diplomacy. (7) Yet, the video deals with none of the above and, in fact, at the end of the documentary one has a hard time to describe what “the story” is really about. In Ying and Bai, authenticity seems to be displayed in the recording of the everyday routine of a panda and his caretaker. However, the shots are often edited and explicitly manipulated to comment on the unusual ménage à deux. In fact, editing and camera angles change the relation between Ying and Bai into a ménage à trois as the woman and the panda’s enclosed reality is invaded by the outside world broadcast on the television set with which they both share their lives. The staging of an artificial viewing relationship between the panda and the television set upsets the idea of authenticity in the film even further. The opening shot is framed upside down. Shown through a set of iron bars that clearly indicate that the camera is located behind a cage, one can see a little television set with a window on the background. A news program is on. A woman enters the shot, hangs a picture on the wall, moves towards the camera, opens the cage, gets a bowl out and exits the frame. At this point, a cut to a medium-shot of a panda sitting on its head reveals the source of the previous point-of-view shot. The next shot is a close-up of the upside-down television screen with a news journalist who is reporting on President Bill Clinton’s potential impeachment. As we realise that the panda is actually watching the news, the tone becomes humorous. The scene suggests that the documentary is going to be an exploration of the life of a panda captured from his perspective, with some sardonic comments on the human beings who surround him. As the video introduces Bai, a sad-looking single woman whose life has been dedicated to the training and care of Ying, an odd love story unfolds. The relationship between the woman and the panda is shown in its most intimate and almost sensual details. The intensity of Bai’s physical connection complicates the documentary both at the formal and content levels. In one scene, Bai strokes Ying through the bars of the cage. The camera’s point of view is once again placed inside the cage, but, unlike in the scenes in which the panda is shown as if watching television, the panda’s reaction (or, in fact, lack of reaction) is not exposed. The absence of the shot-reverse-shot structure keeps the focus on the woman’s agency in this interaction with the panda. Surrounded by a dark background, the close-up of her face kissing the panda is strikingly bright and her skin is exposed in piercing detail. While softly addressing him, she strokes him with both sensuality and sorrow. The mocking tone is gone; Bai’s deep sadness and solitude fill the screen. Sexuality, its repression and its outlets eventually become the unexpected focus of the documentary. In one scene, the panda is shown rolling on his back while seemingly looking into the camera; a laconic subtitle helps us decode his movements: “Masturbation”. Off screen, a female voice talking over a fast-paced music background encourages to move up, left and right. The soundtrack already suggests what the next shot – a medium-shot of the television screen – reveals: the panda is watching television, again. At least this is what the narrative shows, but does not ask us to believe. On television, three women in aerobic shorts are stepping up and down. As the blonde who is leading the exercise in the front asks, “Aren’t you feeling your body getting hot?”, the camera returns to the panda rolling in the cage. While the scene clearly invites laughter, the joke is not so obvious. Are we laughing at the masturbating panda or at the women on the screen? The documentary does not provide time to intellectualise the rapid mockery into a structured message as the following fragment of Bai’s life shifts again. However, Bai never becomes a real protagonist. Very scattered information about Bai’s life is given through short inter-titles. For instance, we learn that she is half Chinese and half Italian, used to be a fit dancer and left China to live for a long period of time in Canada. However, in the mosaic many pieces are missing. Rather than expanding on Bai’s unusual life story and engaging into a serious exploration of her solitude, the following scenes revert to lightness and instead go back to illustrate the everyday routine of her life with Ying (e.g., his defecation, his baths, his eating habits) and their physical connection. Ying and Bai ends with no real conclusion and ultimately challenges not only the idea of a linear narrative, but that of genre and mode as well. The video evokes elements of nature show, docudrama and mockumentary, while also shifting from satirical to empathetic tones. Its mode of representation of the real relies on manipulative shots rather than the “on-the-spot-realism” typical of the move towards authenticity initiated by the “new documentary movement” and its subjective conjectures about reality. (8) Disguised as a documentary on a panda, Ying and Bai is better described as an exploration into trans-gendered and trans-human sexualities and unfulfilled desires. The panda and his trainer both share a life behind bars in which the outside world is out of reach and only accessible through a television. On screen, old films, news and morning fitness programs are the only markers of time in the unchangeable and timeless routine of Ying and Bai. For example, we know that one year has gone by because of the television news references to Clinton’s sexual scandal, the bombing of the Chinese embassy in Belgrade, and the millennium bug. 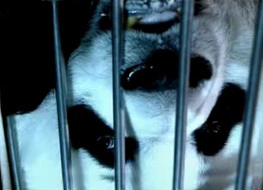 But on almost every occasion, each piece of mediated reality is shown as remote (shown through the cage bars), absurd (displayed upside down) and laughable (as seen through a panda’s perspective). The only tangible, compelling and authentic moments are the small and intense pleasures the two prisoners can offer to each other when the television is off. Self-reflectivity and irony have also been recurrent traits of online movies. Unlike their feature-film counterparts, which can only be downloaded either illegally or at a cost, cellflix (mobile phone movies) and e gao (spoofs) are mostly legal and free. (9) While cellflix are rarely longer than a minute, spoofs are much longer, generally ten to twenty-minutes long. (10) Both phenomena have generated widespread discussions on Chinese blogging sites and, recently, Hu Ge’s spoofs have also attracted the attention of western media. The free, creative flow of online movies is likely to be further regulated by the Chinese government, which for now continues to focus on word-based filtering for its censorship. In the meanwhile, cellflix and web spoofs are enjoying relative freedom. For instance, in January of 2006, the Shanghai-based magazine Metroer launched a cellflix online competition and the submissions can be viewed and downloaded from small windows within the larger Metroer webpage. (11) Mostly entertaining and light, the hyper short format of these movies fulfils both the desire to exhibit one’s fast-created visual work and the quick curiosity of the web visitors. The “one click” easiness of the cellflix distribution and reception is certainly an important factor in defining both the quality and the aims of these movies. However, upon a second, more attentive look, these movies show more than their average 40-second format seems to allow. Most of these flix contain explicit references to films, parodies of famous events and people, or more implicit commentaries on urban isolation. Lightness becomes parody and explicit satire in web spoofs. The most famous one is Yige mantou yinfade xue an (The Bloody Case that Started from a Steamed Bun, a.k.a. A Murder Caused by a Mantou), a spoof of Chen Kaige’s Wuji (The Promise, 2006). The video began to circulate on the web in February 2006, just weeks after the official release of the film. The producer, Hu Ge, declared that he decided to create this spoof because he was extremely disappointed by Chen Kaige’s film, and was mad about having wasted his money and time to watch such a bad movie. Hu Ge had also previously produced a spoof of The Matrix (Wachowski Brothers, 1999), but it was only when he successfully parodied The Promise and was also threatened by a lawsuit that he became a big hit among netizens inside and outside China. The spoof originated its own sequels, like Yige mantou fayinde mafan (The Troubles Caused by a Bun), which relies on clips from Hong Kong films starring Stephen Chow, and Yigen kuaizi fayinde ming’an (The Murder Caused by a Chopstick) that spoofs Zhang Yimou’s Yingxiong (Hero, 2002) while also making some references to Osama Bin Laden. (13) Hu went on to produce his first self-produced mini-feature film, Niaolong shan jiao fei ji (Annihilate the Gangsters on Niaolong Mountain), a parody of famous films (although this time no original footage was used to avoid copyright problems). The movie was released as a web video on 6 June 2006. While widely circulating among the netizens, spoofing is a popular culture phenomenon that is very limited by its medium and the required computer literacy required for viewing or downloading web-based videos. Furthermore, although produced for entertainment, their commercialisation beyond the usual association with internet advertising (e.g., Google ads) remains unlikely. In the Chinese context, movie-making and screening environments still remain under the control of the State, although whether such control is factual rather than nominal has increasingly become a source of debate. Independent movies have been the privileged location for exposing the constrictions and the limits of such control. Sixth Generation filmmakers working outside the film bureau’s approval have been regarded as either the champions of an underground resistance to censorship in China or de-facto allies of the system that banned them but ultimately allowed them to gain first an international reputation and then even a domestic popularity. In both cases, the implied assumption has been that, in Chinese cinema, dissent is a serious matter, either an issue to debate and fight for or one to condemn and attack. On the other end of the spectrum, one finds those working with the blessing of the system. Among these commercially successful filmmakers, one finds the new practically minded like Feng Xiaogang, as well as established filmmakers like Zhang Yimou and Chen Kaige, who have also put their creative efforts towards the production of the ultimate blockbuster. Still largely unknown are the movies that are discussed in this essay. Produced by moviemakers ranging from professional documentarians to amateur videomakers, these other movies belong to neither movie theatres nor art galleries. Rarely, if ever, broadcast on television, they have very little or no commercial potential. They are far from being mainstream, but they do not claim to represent any serious dissent. They are popular culture products that are not likely to actually become popular. Being unpopular is not the same as being controversial. While some of these movies deal with delicate social issues such as prostitution or homosexuality, many are simply not suitable for television broadcast, not because of censorship’s problems, but rather because of their unusual length or format. Furthermore, even though political and social concerns are not necessarily rejected, they are often dealt with an unserious or even frivolous tone. In most cases, such lightness is not synonym of superficiality, but rather reflects the moviemaker’s own self-reflective and often ironic agenda. My brief exploration of visual pleasures offered by independent movies circulating outside movie theatres shows that the connection with cinema remains an important reference. Even though many movies have almost completely abandoned film as a medium and the silver screen as an outlet, the connection with cinema has not been disengaged, but complicated instead. Not only are films the main inspiration sources for spoofs, but films remain the archetype against which videos (DV or cell flicks) variations are developed. Yet, the critical discourse surrounding Chinese cinema is still mostly constructed around the supremacy of full-length feature films, which has defined as marginal all other genres. What makes the study of movies like Ying and Bai even more peripheral to film studies is that not only do they depart from what Christian Metz has defined as a “king’s highway of filmic expression” (i.e., “the feature-length film of novelistic fiction”), but, in doing so, they also engage with means of production and distribution outside film studios and movie theatres. (16) Given such premises, it is no surprise that, with very few exceptions, the discussion on media other than film has been carried on separately from cinema. (17) A more inclusive and interdisciplinary approach to movie-making which acknowledges the centrality – rather than peripherality – of the relationship between film and new media is a necessary and long-overdue addition to Chinese film studies. While discussing the relevance of movies produced thanks to the introduction of new technologies, a note of caution might be worthwhile. The possibilities offered by the introduction of DV, cyberspace and mobile phones should not be overemphasised and need to be understood in relation to the new media environment developed in what Chris Berry has appropriately defined as post-socialist China. (18) Since the early 1990s, cinema, television and the internet all underwent important reforms and changes. (19) Currently in China an impressive number of television stations run their programs with different degrees of autonomy, but arguably enjoy a less imposing censorship than the state-run China Central TV (CCTV). Film production and distribution has also undergone some major reforms. As the case of the Sixth Generation has shown, not only is it possible to shoot a film without the Film Bureau’s official approval, but even if a film is not released in movie theatres, it can still be legally distributed and purchased as a DVD. (20) While one should not overestimate the power of the internet, web posting (e.g., file transfer protocols, peer-to-peer file-trading systems, blogging, moblogging) has also managed to create new spaces for the distribution of films and videos. In sum, the availability of cheaper and more manageable means of production would not have had the same significance had the channels of distribution not also been renovated. Thus, the relevance of “non-feature film” independent movies does not lie in their technological novelty per se, but rather in how they are contributing to redefine the visual in China, while also de-intellectualising the discourse on dissent and avant-garde. Their most provoking feature is not the use of new means of production and distribution, but their deployment of lightness and their exploration of mockery, sarcasm, paradox and insincerity as evocative and disobedient visual pleasures. Art historians, critics and curators have been quite active in the debate over the new experimental art. See Wu Hung, Transience: Chinese Experimental Art at the End of the Twentieth Century, revised edition (co-published with the David and Alfred Smart Museum of Art, 2004). Chris Berry and Bérénice Reynaud have helped pioneered the discussion on documentary filmmaking, but much work is yet to be done in this area. Scholars working on cinema have not yet given enough attention to the recent development of video-making and its significance in changing film culture at large. By using the term movie, I wish to emphasize that, increasingly, “film” is no longer the main medium for these type of works. In China (as elsewhere), digital technology has impacted on almost all visual arts, from feature films to video arts. For instance, director (screen writer and novelist) Cui Zi’en has exclusively used this type of medium to produce his videos. The winner of the 63rd Venice Film Festival was Jia Zhangke’s Sanxia Haoren (Still Life, 2006), which was entirely shot on a high-definition digital camera. I borrow and adapt the notion of lightness from Milan Kundera’s association between the multiplicity of insignificant events and their deep (unbearable) meaning in defining human existence. The movie is distributed as jilupian (documentary) by Channel Zero Media (CZM). According to CZM’s viewing data, Ying and Bai was broadcast only once on 11 April 2002 on Yangguang weishi channel. Ying and Bai was awarded Best Documentary, Best Director, Most Innovative Documentary and Best Sound Effects at the Sichuan Television Festival in 2001. It won Best Director at the 19th China “Golden Eagle Awards”. It was also selected for the FIPA in France, as well as the Shanghai International TV Festival. CZM website, filmmakers: www.bjdoc.com/english1/makers-yiqingzhang.htm. In line with a long tradition of using pandas as a gift to support diplomatic relations (a tradition that is well-exemplified by the donation of a pair of pandas following President Richard Nixon’s 1972 visit to China), in March 2006 the Chinese government offered to send two pandas to Taiwan. The offer was viewed by many as an attempt “to destroy Taiwan’s psychological defenses”. Huang Shi-cho of the Taiwan Solidarity Union party, quoted in Mark Magnier, “Attack of the Pandas: Will Taiwan’s wary, pro-independence government succumb to a pair of China’s most adorable ambassadors? History says yes”, LA Times, 21 March 2006. Chris Berry’s translation of jishizhuyi as “on-the spot-realism” well captures the close link to a very specific temporality that characterised most of the works that are generally referred to as part of the “new documentary movement” of the 1990s. Lü Xinyu was the first scholar to use the term “xinjilupian yuundong” in her book, the first book-length analysis of the renewal of Chinese documentary. Chris Berry, “Facing Reality: Chinese Documentary, Chinese Postsocialism”, in Hung Wu, Huangsheng Wang, and Boyi Feng (Eds), The First Guangzhou Triennial Reinterpretation: A Decade of Experimental Chinese Art 1990-2000 (Guangzhou: Guangdong Museum of Art, 2000), pp. 121–31. Lü Xinyu, Jilu Zhongguo: Dangdai Zhonguo xin jilupian yundong (Recording China: Contemporary Chinese new documentary movement) (Beijing: Shenghuo, dushu, xinzhi sanlian shudian, 2003). The term cellflix is used as the English equivalent to shouji dianying (cell phone movies) on the Metroer website and explained as the merging of “cellphone + films”. One wonders if the creators of this term wanted to reference the Australian-based Film Lovers of Independent Cinema (FLICs) or the controversy surrounding copyright violation and companies like Clean Flicks, Flick’s Club and Family Flix, which re-edit and then rent “clean” versions of films. Most of the videos that populated video sites like YouTube.com are made with cell phones rather than DV cameras; blogging has increasingly turned into moblogging (mobile blogging). A link to the Cellflix page is on the main Metroer page. A complete list of the submissions also includes DV short movies. Tango on the fingers was posted by kfotoe on 2 April 2006 and won the first prize. Metroer decided to start a second competition in July, as submissions continue to arrive. Both videos were available for free download on several sites. “The film was uploaded on YouTube.com and then seen by the whole wide world. As of 19 May, 1.2 million people have watched the video clip! (Update: 1.9 million as of 26 May; ETTV cited a 5.9 million figure on 27 May, which probably combines all the editions)”. EastSouthWestNorth, www.zonaeuropa.com/20060524_1.htm. 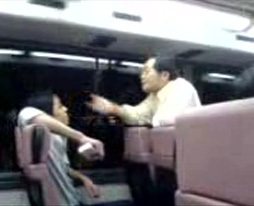 The original video is available on YouTube (last accessed on 20 August 2006), where one can also find links to all the other versions. Christian Metz, “From Film Language. Some Points in the Semiotics of the Cinema”, in Gerald Mast, Marshal Cohen, and Leo Brady (Eds), Film Theory and Criticism, fourth edition (New York: Oxford University Press, 1992), pp. 68-78. In particular, traditionally Chinese television has been studied separately from film, mostly from a communication studies perspective: e.g., Junhao Hong, The Internationalization of Television in China: the Evolution of Ideology, Society, and Media Since the Reform (Westport, CT: Praeger, 1998). Specific television events have been analysed from an anthropology perspective: e.g., Stanley Rosen, and Gary Zou (Eds), “The Chinese Television Documentary ‘River Elegy’ (part I)”, Chinese Sociology and Anthropology, Vol. 24, No. 2, Winter 1991–2, pp. 3–90. Among the exceptions (i.e., comparative studies which bring together film and other media), one finds Bérénice Reynaud, “New Visions/New Chinas: Video-Art, Documentation, and the Chinese Modernity in Question”, in Michael Renov and Erika Suderburg (Eds), Resolutions: Contemporary Video Practices (Minneapolis: University of Minnesota Press, 1996), pp. 229–57, and “Cutting Edge And Missed Encounters: Digital Short Films By Three Filmmakers”, Senses of Cinema, no. 20, May-June 2002. See also Sheldon Lu’s studies on television included in his China, Transnational Visuality, Global Postmodernity (Stanford: Stanford University Press, 2001). While many contested the use of western theoretical categories in the Chinese context, I believe that “post-socialism” is a useful framework of analysis because it does not position itself as a linear, temporally consequential development from a previously accomplished socialism, but rather points to a new awareness of its unstable meanings. For an overview on the recent developments in Chinese media industry and a critical analysis of its changed scope and reception, see Stephanie Hemelryk Donald, Michael Keane and Yin Hong (Eds), Media in China (New York: Routledge Curzon, 2002). For instance, Zhang Yuan’s East Palace West Palace was released on authorized DVD even though the film had not been approved for movie theatre distribution. Google was just the last in along list of big software providers and internet routers (e.g., Microsoft, Yahoo and Cisco) that all reached commercial agreements with China by giving in to certain restrictions. “Internet router firm Cisco had no qualms about building a great cyberwall around China, which blocks Chinese surfers from ‘subversive’ foreign Web sites. Thus Yahoo has obliged the Chinese government by tracing pro-democracy e-mails to one of its users. The e-mailer has been jailed, and Yahoo has effectively become a Chinese police auxiliary.” Sebastian Mallaby, “Google and My Red Flag”, Washington Post, 30 January 2006. According to a state-sponsored study, Chinese internet users are estimated to number more than 130 million (about eight to ten percent of the total Chinese population). China Internet Network Information Center (CNNIC), 16th Statistical Survey Report on the Internet Development in China, July 2005. Marshall McLuhan, Understanding Media: The Extensions of Man (London: Ark, 1987), and Pierre Levy, Collective Intelligence (New York: Plenum Publishing Corporation, 1997). Paola Voci has a B.A. in Chinese Language and Literature, Venice University 1991; Diploma in Film Theory and Practice, Beijing Film Academy 1991; M.A. in East Asian Studies, Indiana University 1997; PhD in Chinese, Indiana University 2002. Her area of research combines East Asian Studies (in particular, Chinese language and culture), film and media studies, and visual culture.